Apple today released iOS 11.1.1, the sixth official update to the iOS 11 operating system. iOS 11.1.1 comes a week and a half after Apple released iOS 11.1, the first major update to iOS 11. iOS 11.1 introduced new emoji and included several important bug fixes. The iOS 11.1.1 update can be downloaded for free on all eligible devices over-the-air in the Settings app. To access the update, go to Settings --> General --> Software Update. Today's update addresses bugs and issues that have been discovered since the release of iOS 11.1. The update fixes an irritating autocorrect bug that has been plaguing a growing number of users. 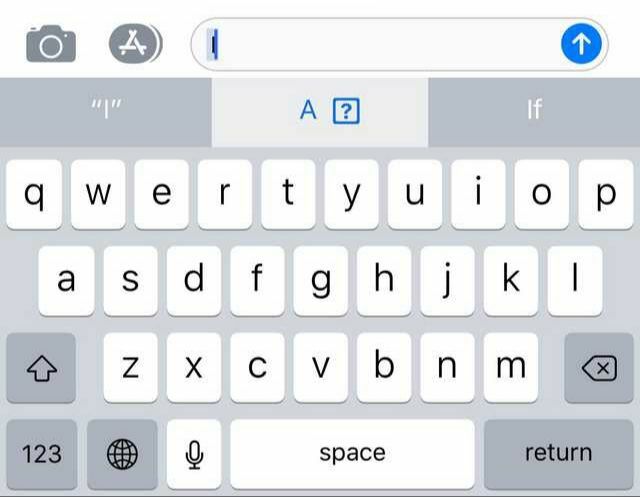 The bug causes "i" to autocorrect to A[? ], and is a problem that has been affecting users since the beginning of November. Apple addressed the autocorrect bug in the iOS 11.2 beta, but it has been spreading to more and more users and is not an issue that the company could wait to fix with iOS 11.2. Today's update also fixes a bug that could cause "Hey Siri" not to work. Apple's iOS 11 update, first introduced in September, brings a redesigned Lock screen experience, a customizable Control Center, a more natural Siri voice, a redesigned App Store, new HEVC and HEIF codecs for better photo and video efficiency, and an entirely overhauled interface for the iPad. For more info on all the new features in iOS 11, check out our iOS 11 roundup. Another update. Gee, has it been a week already? Yeah, how dare they continue to fix issues so quickly, rather than waiting months and letting people suffer in the mean time! THE NERVE! Wow. SIX releases in just over a month. This obviously silences the last remaining few who were still arguing there was nothing wrong with the .0 public release. And what a pain for the casual user (not us) to constantly get bugged by updates, I know most of my non-tech geek friends hate it. They should have released a finished product to start with. * They complain when Apple holds an event that doesn't have enough "WOW!" I just don't recall previous iOS major releases having this many bug releases following the initial drop. 11, 11.0.1, 11.0.2, 11.0.3, 11.1, now 11.1.1 and 11.2 coming in a few weeks. Seems just a wee bit excessive. Perhaps SW Quality just wasn't ready for the major iOS 11 release. Wow. SIX releases in just over a month. This obviously silences the last remaining few who were still arguing there was nothing wrong with the .0 public release. No, it doesn't. The amount of releases says nothing about quality — would 11.0 have been a better release if 11.0.1, 11.0.2, 11.0.3, 11.1 and 11.1.1 had all been rolled into a single 11.1 release that had come out today, with no updates in the meantime? Or would it have been a better release if, in the other extreme, even more smaller (but timelier!) updates had been rolled out? No. It would have been different, not better. They should have released a finished product to start with. This isn't how the world works. If you want that, good luck waiting for iOS 1.0, cause there's still bugs in that a decade later. If you ask me, only thing decent to come out of iOS 11 so far are the iPad tweaks. Aw yeah. Still running iOS 10. Agreed, and as long as the sheeple keep updating to the latest and greatest on day one, instead of holding back, nothing will change. It will only get worse. The bleeding edge updaters are the beta testers. Doing it for free... for the richest company in the world. And a company who's standards are slipping, and slipping badly. iOS10.3.3 here, patiently waiting for a more stable product before jumping on board. And as long as people like you keep using the word sheeple, people like me will continue to seriously dislike you & completely discount anything you say.